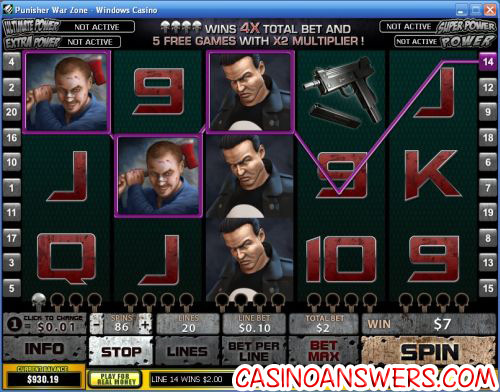 Punisher: War Zone Video Slot Guide & Review - Casino Answers! Punisher War Zone is a 5-reel, 20-line video slot developed by Playtech, featuring scatter wins, wild symbols, a collective bonus, free spins and a four-tier progressive jackpot. 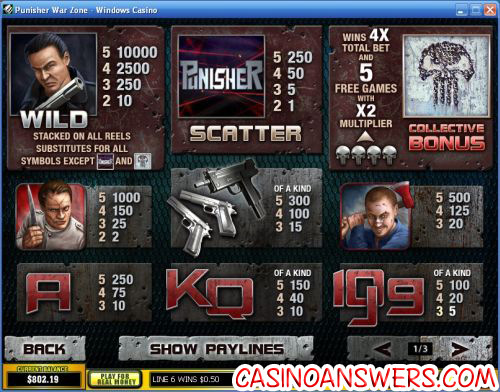 You can play the Punisher War Zone Marvel Comics video slot at William Hill Casino and Vegas Red Casino. To play the Punisher War Zone video slot game, set your coin value at $0.01, $0.05, $0.01, $0.25 or $0.50. Next, you can set your bet per line at 1-10X your coin value (essentially 1-10 coins) and set the number of lines (up to 20). To play all 10 coins and 20 lines, use the “Bet Max” button. The smallest total bet you can make on the Punisher War Zone slot game is $0.01 per spin, while the highest total bet is $100 per spin. This makes the Punisher War Zone slot game great for both high rollers and casual slots players no matter what side of the spectrum you fall on. to play Punisher War Zone, use the “Spin” button once you have chosen your wager. The Frank Castle (Punisher) wild symbol is the top fixed jackpot symbol in the Punisher War Zone movie video slot. 5 of these symbols on an active payline will win you the 10,000X top jackpot! The wild symbol is stacked on all reels (meaning three can appear ontop of eachother). It will substitute for all symbols except for the scatter and bonus symbols. The Skull symbol acts as a Collective bonus symbol. You must collect four of these symbols on a reel and you will win 4X your total bet, plus 5 free games with a 2X multiplier. Once you get a Skull symbol, it will be shown on the bottom of the reel. The number of skulls under the reels will remain the same if you exit and re-enter the game. If you change your total bet, you will lose all of your skulls until you return to that total bet. All Playtech Marvel slots are linked to four Mystery Progressive Jackpots: Power, Extra Power, Super Power and Ultimate Power. All four jackpots are won randomly. Any spin of any amount in the slot game can trigger the Jackpot Game, including losing spins. However, the higher the bet you make, the bigger your chances will be of triggering the Jackpot Game. If you do trigger the Jackpot Game, you will guarantee a win of one of the four jackpots. The Jackpot Game has a 4X5 grid of 20 squares hiding different jackpot symbols. Click on the squares to reveal the symbols. Match 3 symbols and you will win that jackpot. The Jackpot Game has a reaction timer. One of the jackpots will be paid automatically if you do not react in time. Punisher War Zone has a good top fixed jackpot and the ability to win even more with the progressive jackpots, but does lack in some special features such as a bonus game or a better free spins feature. To play the Punisher War Zone video slot, sign up now at William Hill Casino! Where can I read more comic book slot reviews? You can read reviews for video slots featuring Batman, Blade, Captain America, Daredevil, Elektra, Fantastic Four, Ghost Rider, Iron Man, Incredible Hulk, Punisher, Silver Surfer, Spider-Man, Sub-Mariner, Superman, Thor, Wolverine Wonder Woman and X-Men in our Marvel & DC Comic Books Slots article. Are USA players able to play the Punisher War Zone video slot? No, American players are unable to play Punisher War Zone at Playtech online casinos. As an alternative, we recommend you try playing the iSlots at Rival casinos such as the USA-friendly This is Vegas Casino.